Have you ever wonder how is the sensation of breathing under the water? 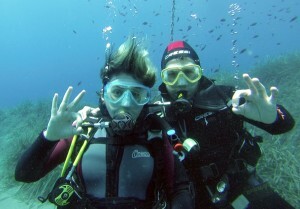 With the Discover Scuba Diver experience, you will have the chance to discover the incredible underwater world. We will start with a theory lesson in which we will explain some basic knowledge (avoiding compression pain, how to move once we are in the water, …). Then, we will move by boat to the dive point in the San Andrés Island, natural monument where the fishing ban since 2013 makes this place to be one of the richest in aquatic life forms and plants. The first exercises will be done in a depth between 2 and 4m, previously explained and demonstrated by the tutor. 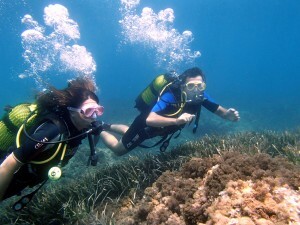 Afterwards we will dive enjoining the charms of the sea and learning some things about its fauna and flora. Without being a diving certification, the Discover Scuba Diver will allow you to try the sensation of breathing underwater in an idyllic environment, enjoying an unforgettable and safe experience, since at all times you will be accompanied by an instructor or a Divemaster. You can repeat the experience as many times you want, but if you already enjoyed once, we recommend you to do the Open Water Diver starting course to become a certified diver. That will allow you to dive without supervision wherever you go. Structure: Theory lesson and diving with autonomous equipment from the boat. Material: It includes all the material you will need (heavy equipment, light equipment, air tank, weights and dive insurance). The only thing you will need to bring is towel, swimsuit, sun screen and toiletry to have a shower after the dive. If you experience dizziness, we recommend you to consult your doctor first. Duration: 3 hours (under the water around 45 minutes, the autonomy that gives us the bottle).